I had a night of fitful sleep due to knees and feet throbbing (and the occasional baby cry from the adjoining room). I therefore decided that comfort was paramount for the 15 hours aboard the plane back home and didn’t join the other three in their exploration of San Francisco. They left after we had an early buffet breakfast, with tasteless scrambled eggs and dry pastries but nice fruit - all we could eat for $25US. To avoid being too sedentary while at the hotel, I completed the minimum 250 steps per hour FitBit demanded of me. I had a squiz at the ‘fitness room’ on Level 2 where two men were puffing and grunting away in a windowless room. In the pool on the ground level (Level 1 in USA) a couple of dads were making their kids scream at high pitch. The cafe was serving Starbucks coffee so I bought a can of Diet Coke instead. At the restaurant/bar, drinking starts at 11am in front of screens televising football (American college football or NRL, aka grid-iron). Housekeeping ignored the ‘Do Not Disturb’ on my door and tapped away at my door at one point. Grrrr. We are staying at The Westin San Francisco Airport hotel. Now I know airport hotels generally aren’t that flash but with the name Westin attached to it I thought it would be pretty darn nice. 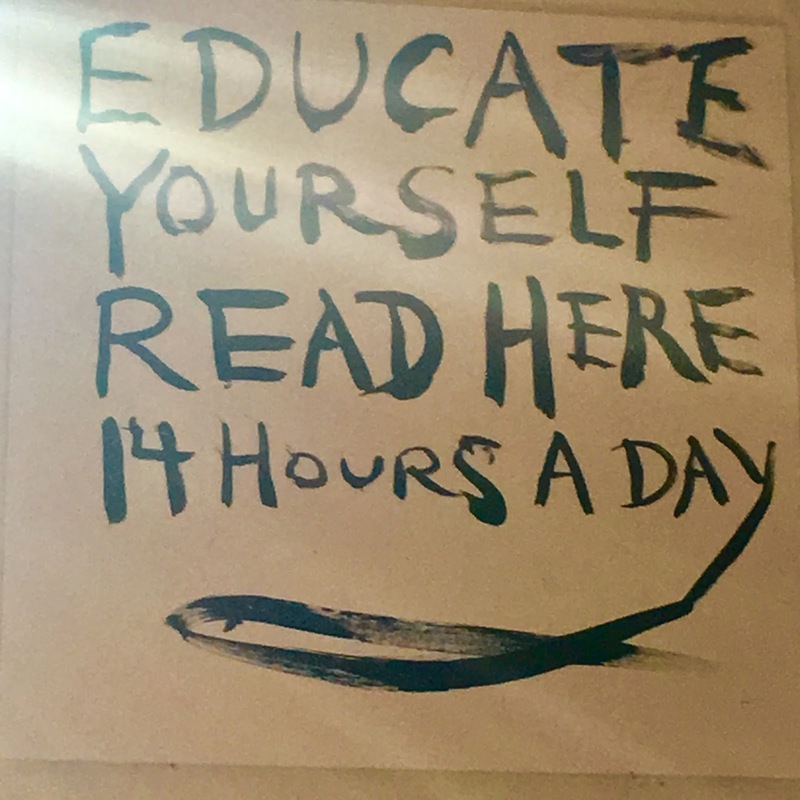 It’s adequate. But don’t go imagining it’s anything like The Westin in Sydney at the old GPO. I’ve stayed there and it is love-er-ly! 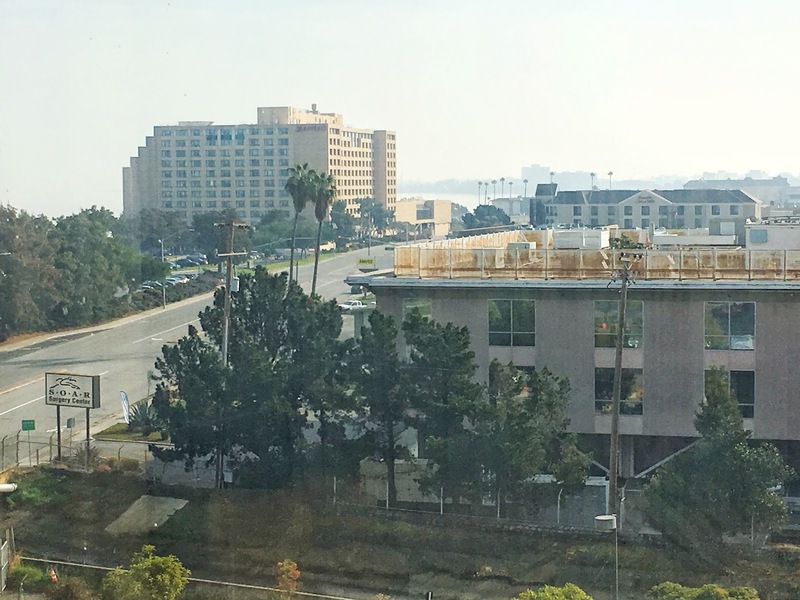 Yesterday’s post had a picture from the airport side of the hotel. The following photo is from the other side and this one (hyperlinked) has been uploaded to Google Maps. I had images of the surgery centre in the foreground offering dodgy deals for FIFO customers in return for their kidney, liver and/or testicle. Selling an organ is illegal in Australia but the laws aren’t the same here. Before I disparaged the business’s name with my wild imagination I went to the trouble of Googling them (on the sign, bottom left in the photo). SOAR Surgery Center is a legitimate, well respected team of physicians with SOAR being an acronym for Sports Orthopedic and Rehabilitation. They are also the official physicians for the San Francisco Giants. You’d think if they were that good they’d be able to secure themselves more attractive property! When the three returned from their expedition I asked for a run-down of what they’d seen and done. As part of her university course work, Emma had written an essay about ‘comfort women’. This is a euphemistic term for women from China, Philippines and Korea who were forced to serve Japanese soldiers during WWII and often killed once they were no longer needed. IT is a part of war history that has only become known fairly recently because the women who dared to speak about it in their home country were ignored at the time. 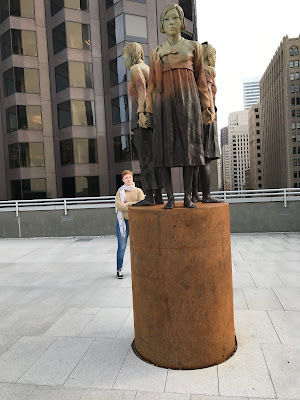 A statue to the ‘comfort women’ has been erected near Chinatown in San Francisco so Emma visited it today as a mark of respect. This New York Times article (hyperlinked) shows the mayor of Osaka’s reaction. This article linked to an abc news article about a statue that has also been erected in Croydon Park, Sydney. 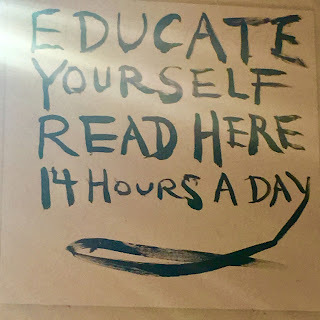 They then wandered through Chinatown and on the other side discovered the City Lights Bookstore. Some time was reportedly spent there and Emma returned with two books. She demonstrated restraint! John keen to ride a cable car but the desire left him when he encountered a wait time of 90 minutes. 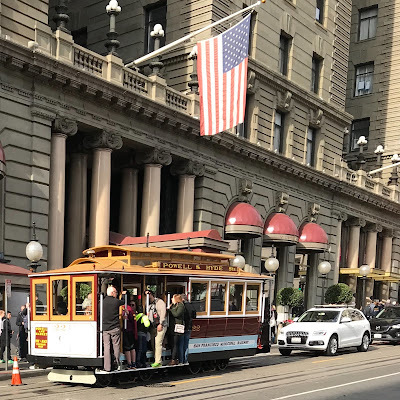 They considered just jumping on one while it was moving and hang on the sides, as seen in movies, but didn’t have the gumption since the cable cars were too crowded. 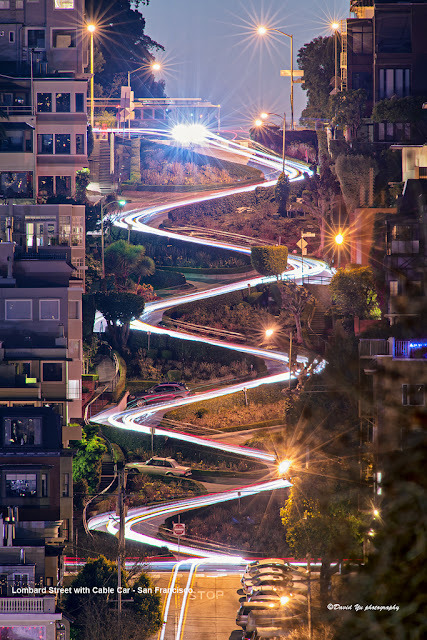 Griffin said that at Lombard Street, the famous zig-zag street of San Francisco, he could have stared at it forever. He recalled it from one of the Herbie movies and a segment Mythbusters did and was just fascinated by it. 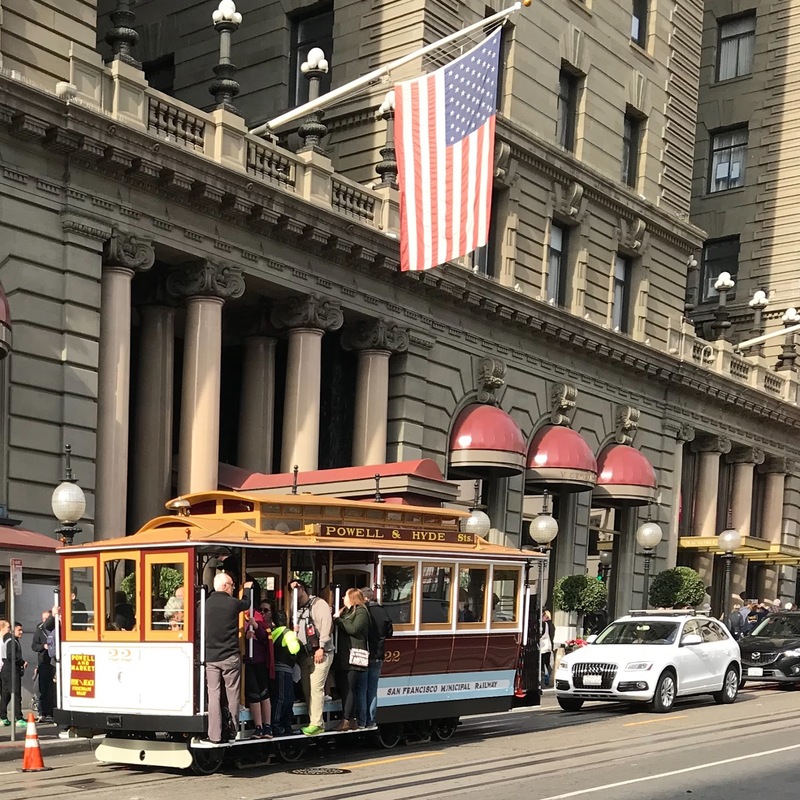 They finished their tourist walk at Fisherman’s Wharf and summoned an Uber to return to the hotel. The convenience has meant we have spent over $400 with Uber this month but I feel guilty about it. I am ideologically opposed to Uber due to (1) the hard won safety requirements imposed on the taxi industry being undercut and thus damaged by them (2) their exploitative practices with passengers and their employees, and (3) their initial support of Trump. We are now about to finish packing and head to the airport. See you on the other side.